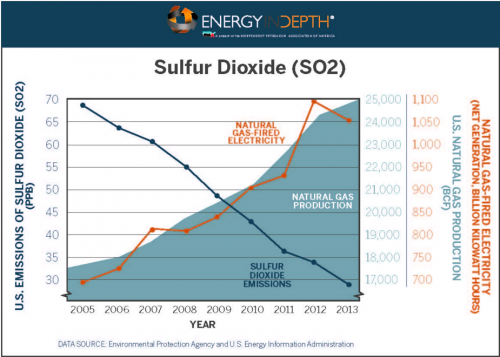 Evidence of shale gas’ huge role in continued declines in U.S. CO2 emissions, as well as the three major electrical power plant pollutants – sulfur dioxide, nitrogen oxide, mercury – is obvious to any objective observer. And now, it has become so obvious that even a recent study conducted by fracking opponents Ceres and Natural Resources Defense Council (NRDC) acknowledges natural gas’ contribution. “Benchmarking Air Emissions,” an annual report spearheaded by Ceres and co-sponsored by the Natural Resources Defense Council – both well-known anti-fracking groups – analyzes emissions data for the nation’s 100 biggest power plants, which account for 85 percent of U.S. electricity and 87 percent of the country’s energy-related emissions. The report boasts that energy-related sulfur dioxide (SO2), nitrogen oxide (NOx), mercury and carbon dioxide emissions have all plummeted since 1990 (based on 2014 data, the latest year available), as EID has highlighted several times before. Ultimately, the following facts are just too overwhelming for the Ceres/NRDC report to deny: electrical generation has long been the top source of all the aforementioned pollutants, and the increased use of natural gas is the No. 1 reason for these declines, especially considering its share of the electrical generation mix jumped from 22 percent in 2007 to 28 percent to 2014. The following graphic from the report clearly demonstrates this trend. This graphic illustrates how increased use of natural gas for electrical generation has correlated with sharp decreases in emissions of major air pollutants. Here are some other key takeaways from the report, along with natural gas’ role in making them possible. Concurring with the findings of the report, EPA data shows that SO2 emissions have declined rapidly in recent years. 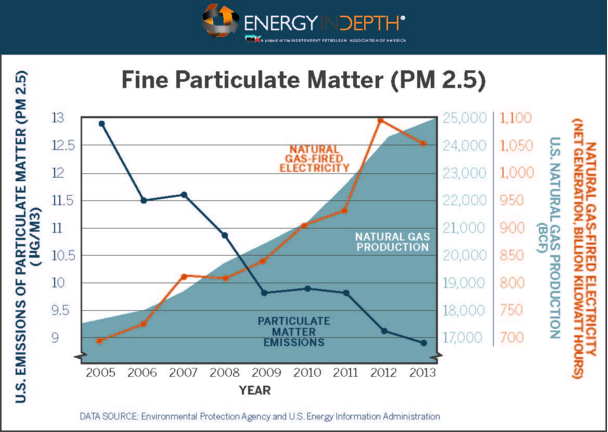 Fortunately, U.S. PM 2.5 levels decreased 60 percent from 2005 to 2013, according to data from the U.S. Environmental Protection Agency (EPA) and the U.S. Energy Information Administration (EIA), and this report indicates that trend will continue. EPA Administrator Gina McCarthy has also explained, “cheap natural gas—mostly from fracking operations—has improved air quality in the U.S.” by replacing “mercury-laden” emissions from other energy sources. U.S. Energy Information Agency (EIA) data illustrates that natural gas is spearheading this trend, noting that switching electrical generation fuels from coal to natural gas accounted for 68 percent of the 14 percent total reduction in energy-related CO2 emissions during last decade. 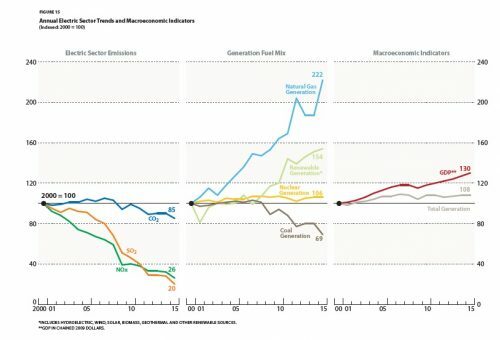 Those reductions have also occurred at the same time the economy grew 15 percent, and thanks to natural gas’ more prominent role in electrical generation, energy production no longer the top industrial source of CO2 emissions. Natural gas use is clearly the No. 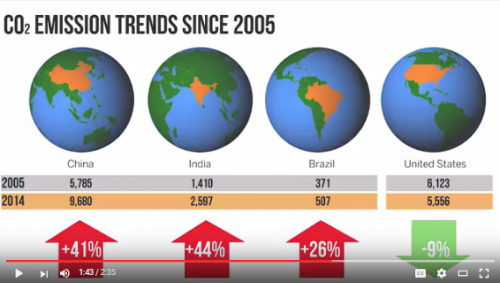 1 reason the U.S. is the only major nation to see a reduction in CO2 emissions in the past 10 years, as the following EID graphic shows. The report also predicts that low natural gas prices will continue, meaning electricity prices should stay low as well. Remarkably, considering the source, the report credits these low prices – almost completely – to the shale revolution. As encouraging as all the data from this report is, it’s important to realize the data would be even more positive if it were more up to date. Natural gas’ share of the electricity generation fuel mix has continued to skyrocket since 2014, increasing to 32 percent in 2015, according to the 2016 Sustainable Energy America Factbook. It has increase at more than five times the pace as solar and other renewable sources combined from 2014 to 2015. 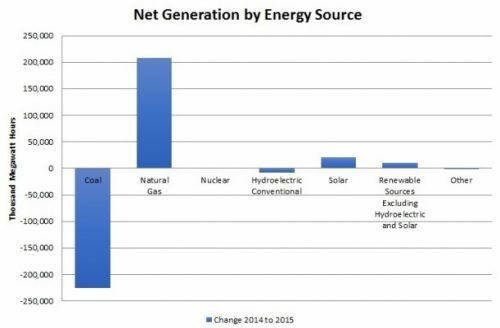 Natural gas also overtook coal as the leading source of U.S. electricity generation for the first time in April 2015 and was the top electrical generation fuel in each of the last six months of 2015. Thanks to this trend, IEA credits natural gas for reducing U.S. energy-related CO2 emissions 2 percent in 2015. EIA also forecasted that natural gas will top coal as the top fuel source for electricity generation in 2016, and so that prediction has been spot-on, as natural gas now accounts for more than 43 percent of the nation’s available installed generating capacity. It would have also been unthinkable that a report spearheaded by Ceres and co-sponsored by NRDC would have such pleasant things to say about natural gas. But, apparently, facts and reality ultimately trump stubborn ideology.